2012 Ford F150 SuperCrew Cab FX4 SOLD!!! Home > > Vehicles > 54565 > 2012 Ford F150 SuperCrew Cab FX4 SOLD!!! This sweet 2012 Ford F-150 Super Crew Cab FX4 4×4 is equipped with the powerful V8 5.0L Flexfuel motor with an automatic transmission and only 54k miles! Our Ford Is ready for any terrain with upgrades like SVT lower arms, Fabtech upper control arm, extended billet steering tie rods, extended CV axles, Dirt Logic coil overs, rear Dirt logic shocks and color matched fiberglass fenders on all four corners to allow for all the suspension to clear brand new 37×12.5×17 Cooper MT tires that are wrapped over Walker Evans 501 Legend Racing wheels! 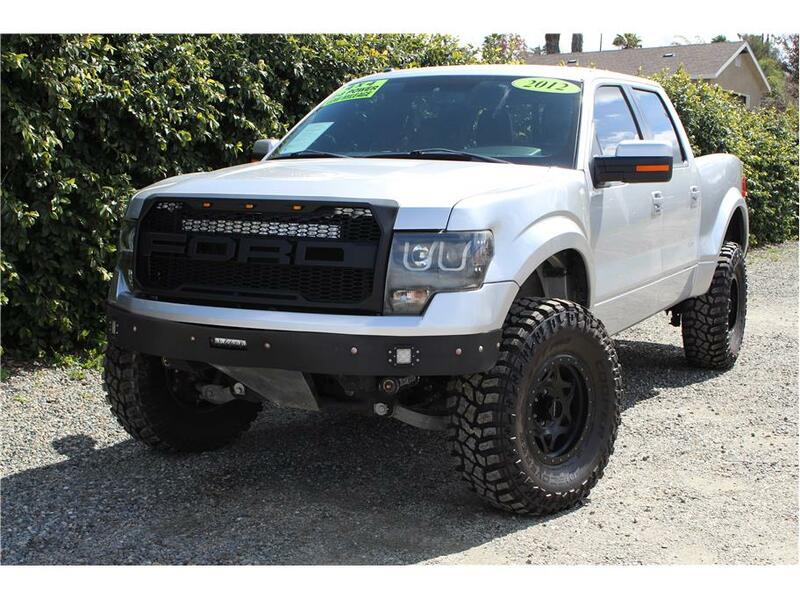 There is also a tube front bumper with aluminum skid plate, valance and integrated Rigid LED lights, rear A.D.D. bumper with tow hitch and an AFE muffler to make that 5.0L roar! Factory options like power leather heated and cooled seats, Power group, Back up camera, Sync by Microsoft, Dual AC controls, rear AC vents, Bluetooth and steering wheel controls. This F-150 just went through a complete 151 point inspection and received a fresh oil change service, four brand new tires and freshly painted fiberglass. A pre-runner like this is ready to take on any adventure, don’t let this pass you up. Come test drive it today! Auto Locators is a family owned dealership that was established in Southern California for over 16 years. We are also a California Licensed repair shop and all of our vehicles receive a 151 point complete and comprehensive inspection by our licensed mechanics. When you buy a vehicle from us we welcome you to our family. Call 909-810-1143 or Text 909-939-9434 or come by today, you can also view our entire inventory on our website at www.theautolocators.com. you can also fill out an application for financing to expedite your dealership visit.